This one is a departure of sorts for us (again) in that ‘Youth Is Wasted On The Young’ is neither deleted nor hard to find. In fact if you still believe that mp3s are the devil’s spawn you can buy the CD from here. But, as you’ve probably suspected by now we are 100% digitally minded round these parts so are proud to offer Michael Knight’s fabulous debut for the all inclusive price of €3.50. For that you get the music, the original artwork and the cosy feeling that you are directly supporting Richie and the gang. That and the fact that once you’ve crossed our palms with paypalness the whole package can be yours within minutes (or seconds if hyper broadband be thy name). No wasteful packaging, no aimless rummaging, just good music in an instant. 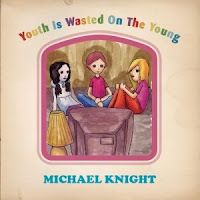 ‘Youth Is Wasted On The Young’ came out in 2005 and since then it has hasn’t strayed too far from our attention. In fact for most of December that year Mr and Mrs Indiecater danced around like mad things with the album as our private disco. At the time I was a Belle & Sebastian obsessive (wavered a tad since) so the perfect little cherubs that were ‘Waves To The Shore’, ‘Leaving Town’ and ‘Seasons’ put a spring in our step and a glow in our heart. But, the delights didn’t end there, no ‘Youth Is Wasted On The Young’ is scattered with genius like moments that never lose their sense of fun or sweet melody. You’d have to look long and hard to find an album so well endowed with winning tunes and that’s why we are intent on doing our best to bring it to as many new people as possible. Anyway, enough of my blathering, it’s always better to hear it from the horse’s (or foals in this case?) mouth so here is lead singer Richie Murphy’s version about how ‘Youth Is Wasted On The Young’ was brought to life. “To the minority in any way familiar with my working methods, that the first Michael Knight album’s journey from genesis to completion was inordinately long should not come as a surprise. To the remainder, presumably, it will be simply a neutral fact at the start of an already increasingly dreary sales pitch. It took approximately two years of rampant inefficiency to complete the record, which began after the release of the No More Lonely Knights EP at the end of 2003. It took seven or eight months to rehearse the (mostly already written) songs, recording was relatively swift (more on that later), mixing dragged on a little but then artwork dragged on A LOT. Mainly because it took stupidly long to figure out a suitable “concept” on my part – the artists and design people involved were infinitely more organised. Depressingly, this pattern was to be repeated with the next record. The recording was probably the most fun, no, interesting, no, expensive part, as is inevitable for anyone’s first experience in a REAL STUDIO. Was it exciting? Being the sort more easily shaken than stirred, I can’t claim to have been rabidly and uncomplicatedly enthused, if for no reason other than that the time spent in the studio alternated between ecstatically listening back to newer recordings (a pox on flattering studio monitors) and disappointedly listening back to older recordings (…whose flattery could only go so far). Being an actual three-piece band who were all good friends and mostly sequestered for the recording period was a fun aspect, and contrasts with the more piecemeal approach of the second album (which brought its own rewards too, I must confess). In terms of the music itself and how it sounds now…it’s hard to say. It often sounds like someone else’s record now, which is what one hopes for if they’re to progress artistically (though there may be other explanations, such as personality disorders). It’s clearly quite a different record to the newer one in some respects, but I often recognize similarities, or anticipations, or echoes (in the other direction), and then there are the moments of joy that are entirely unique to it. In some respects it’s like reading an old diary and lamenting forgotten aspects of oneself. Listen to Youth Is Wasted On The Young! Previous Previous post: Super Discounts!